Overview - The classic comedy that launched the careers of Academy Award winner Heath Ledger (2008, Best Supporting Actor, The Dark Knight) and Julia Stiles celebrates its ten-year high school reunion with 10 Things I Hate About You: 10th Anniversary Edition. This special edition is packed with a million things to love, including an exclusive sneak peek at Heath Ledger's screen test. New kid in school Cameron (Joseph Gordon-Levitt) is smitten with the beautiful Bianca (Larisa Oleynik). The problem is that Bianca isn't allowed to date unless her surly older sister Kat (Stiles) does. Cameron's only hope is to enlist the help of Patrick (Ledger), the school troublemaker with a reputation as nasty as Kat's. This special edition brings back the love-struck high school classmates of '99 with a treasure trove of never-before-seen footage. 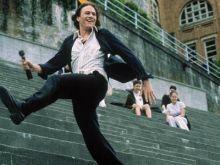 Also featuring a retro soundtrack of memorable nineties tunes, 10 Things I Hate About You is a comedy you can count on. It's hard to believe 10 years have flown by since I first saw '10 Things I Hate About You.' On first viewing the movie, I initially brushed it off as just another high school romance like 'She's All That,' 'Never Been Kissed,' and 'Cruel Intentions.' It was easy to write the film off as just another chick flick. Since then, I've grown to love this movie, and all of its understated quirkiness. '10 Things' purports to be based on Shakespeare's famous "Taming of the Shrew." The students even attend a whimsical, castle of a high school (Editor's Note: It's a real high school in my old haunt, Tacoma, Washington). At points the characters recite Shakespearean lines, in chorus with lines like "Remove head from sphincter, then drive." I'm not a Shakespeare authority, nor do I pretend to be one, but I feel that '10 Things,' because of its original influences, contains something just a little different than those other teen rom-coms of the late 90s. The story is simple, Kat (the shrew) played by Julia Stiles, hates men, the world… basically everything except angst-ridden indie rock. Bianca (Larisa Oleynik), her sister, is the complete opposite. Instead of the grungy midriff shirts that Kat wears, Bianca sticks to flower pattern dresses and pastels. Kat is full of hate, Bianca is the quintessential prissy princess. Their dad is over protective, and comes up with a weird rule that means Bianca can date, but only when Kat does. Cameron, played by a fresh-faced Joseph Gordon-Levitt ((500) Days of Summer), falls for Bianca on the first day of school, but he's got to get around that darned rule. That's where school outcast, Patrick (Heath Ledger) comes in. Cameron concocts a plan to get Patrick to date Kat, so he can date Bianca, it's fool proof. Anyone who's seen '10 Things' knows that the plot and its predictability are its weak points. Instead '10 Things' thrives on its performances and delicate nuances. Larry Miller, who plays Kat and Bianca's Dad, steals every scene he's in. It's worth watching the movie just for his performance. Ledger was just coming into his own in his first major starring role, and the beginnings of a Hollywood superstar were born. Stiles, another relative newcomer, gave herself a name here. It isn't until the special features that you find out when Stiles reads her poem towards the end that crying wasn't scripted during that scene. They used that one and only take of the scene. It's still pretty powerful today. Joseph Gordon-Levitt had seen a good run on TV, but this film thrust him into a male leading role, where he excelled. '10 Things' was a launching platform for some very popular careers. Every time I revisit '10 Things' I'm transported back. It's a nostalgic film of sorts. It has its flaws when it comes to predictable storytelling, but it's got a lot of heart and some fantastic performances. Give it a chance, it will grow on you too. Disney has put some time and care into this 10 year-old catalogue title. The 1080p/AVC-encoded transfer has some flaws, most notably some abhorrent artificial sharpening in places. The opening Mrs. Perky scene is especially horrendous. The rest of the film though, looks slightly above par for a low-budget catalogue title such as this. Colors are nice and vibrant, especially greens and reds. Blacks are crisp, and delineation is clearly defined. Grain storms do spike at times, especially on lighter backgrounds, but it's better than having a picture completely marred by DNR. Skin tones are fairly constant and natural throughout, but there are occasional times where faces seemed washed out. Original source noise does pop up every now and then on a pretty frequent basis, but it isn't something that you wouldn't expect from a title of this vintage. Overall, Disney took its time on this release, and gave it a fairly good presentation that should please fans. The DTS-HD MA 5.1 audio track accompanying this release, is decent, but like the video presentation, it isn't anything that will blow your mind. Surround channels seem to be a tad neglected here, even a crowded house party full of drunk, rambunctious teenagers seems oddly subdued. The front channels present a clear soundfield though. The dialogue is clear for the most part, and the spunky, fun soundtrack is given ample space to spread out and rock. Speaking of the soundtrack, it's pretty much the only time you'll hear the sub woofer engage. All in all this is a sufficient audio track that will be enjoyed by fans, but this is one person that wishes Ledger's rendition of "Can't Take My Eyes Off of You," would've been something that really tested the limits of my sound system. Audio Commentary - It's always nice when an anniversary edition of a film spurs a new audio commentary to accompany it. I like the idea of the creators and cast looking back on their film, instead of doing it in the heat of the moment. Writers Karen McCullah Lutz and Kristen Smith converse about the film with Andrew Keegan (Joey Donner), Larisa Oleynik (Bianca), David Krumholtz (Michael), and Susan May Pratt (Mandella). The commentary track is fun and insightful. I found myself wishing director Gil Junger would have joined in since he was in some of the other new special features talking about what the film meant to him. He would have been a fantastic addition to the team here. Some very interesting moments happen here. Pay attention to what happens when Ledger first appears on screen. A somber moment indeed. 10 Things I Love About '10 Things I Hate About You' 10 Years Later (HD, 36 min) - This is a newly produced featuerette that takes a look back at the production. The main talking head here is director Gil Junger who basically says this is the best time he's ever had directing. It's interesting to see what he has to say about the movie and how he noticed that Heath Ledger was going to be a superstar. Old interviews from the then young cast are recycled here also. The deleted scenes mentioned on the back of the cover are actually only viewable through this documentary, with Junger describing them. The video quality for the deleted scenes is atrocious. '10 Things I Hate About You' grows on you. There's no other way to describe it. It follows the tried and true formula of other teen rom-coms that have gone before and after it, but it has a certain heart that can't be measured. The performances here are the main reason to watch. The solid audio and video presentations are a reason to upgrade your DVD.